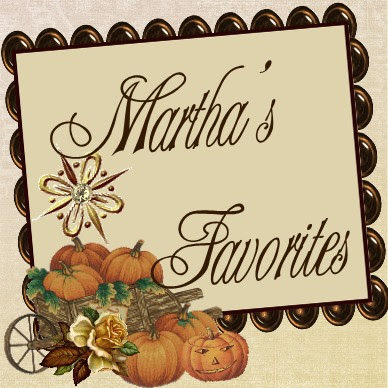 Martha's Favorites: LAST WEEK TO ENTER GIVE AWAY & MORE TEA CUPS! 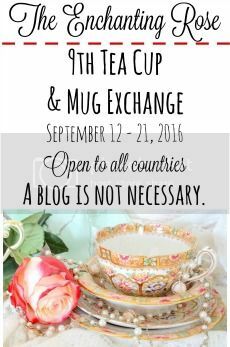 LAST WEEK TO ENTER GIVE AWAY & MORE TEA CUPS! Hello Ladies and welcome to Tea Cup Tuesday No. 237! Hope your week was good. I am glad to report that my son, appears to be on slowly on the mend, thank God. I also want to thank you for all your prayers for our family. My beautiful, daughter, Vanessa, celebrated a birthday this week. She is such a treasure, I thank God for her daily. Grandchildren had a great week of school. No one reported any mishaps, that always does a Grandma's heart good. Still been busy with the house "clean up." I am almost done with the kitchen and will be heading into the Master Bath next. 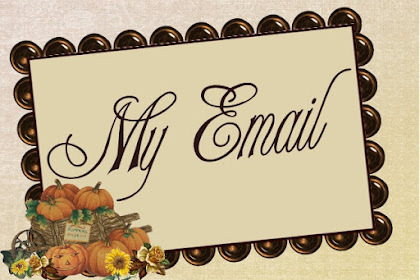 On the way, I have been changing to Fall Decor. Feel real good about this "new" me. If you visit my home, only I can tell how much I have removed. This week I only took one load to the thrift store, should have done more. I found so many new things in my kitchen I just forgot about. It was like shopping, only at home. Only one item I came back with me this week. It was this great antique French Iron Basket from the thrift store. 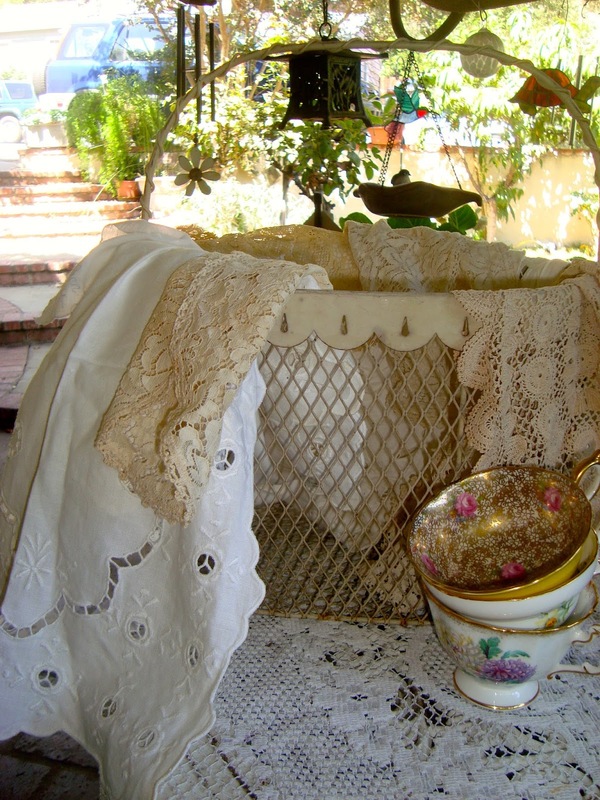 Of course, I did fill it with vintage lace that I found that day too! (I don't count lace.) You can never have enough vintage lace. Really, that is a unwritten law, isn't? Love the Country French look, who knew a Mexican could have that kind of taste? So, out came all the Hens for the kitchen. It puts big smile on my face when I walk in there. It was time for a change. This week I am sharing this beautiful Chintz, Paragon. One of my all time favorite cups and you can see why. Cup No. 2 is Hammersley. This one is covered in Buttercups. They make such amazing cups. The last cup is again a Paragon. Love the vivid colored Mums that decorate this great cup. 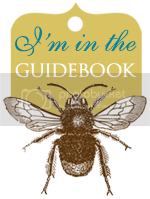 I want to remind you that this is the last week for you to enter my give-away. I will have Sophia pick a winner for next week. 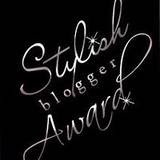 All you have to do is be a follow and leave a comment here and/or on Facebook. Each comment gives you another chance at this fun cup. Please continue to pray for our friend Terri and her son, as well as my family. It will be greatly appreciated. Have a wonderful September and good luck on the give away! Happy birthday to beautiful Vanessa! I'm glad your son is mending, slowly but surely. I will keep my prayers for him and your family, sweet friend. Thanks for the lovely giveaway chance. Thanks for hosting this lovely party always too! keeping prayers coming for your son. You tea things today are lovely as usual! 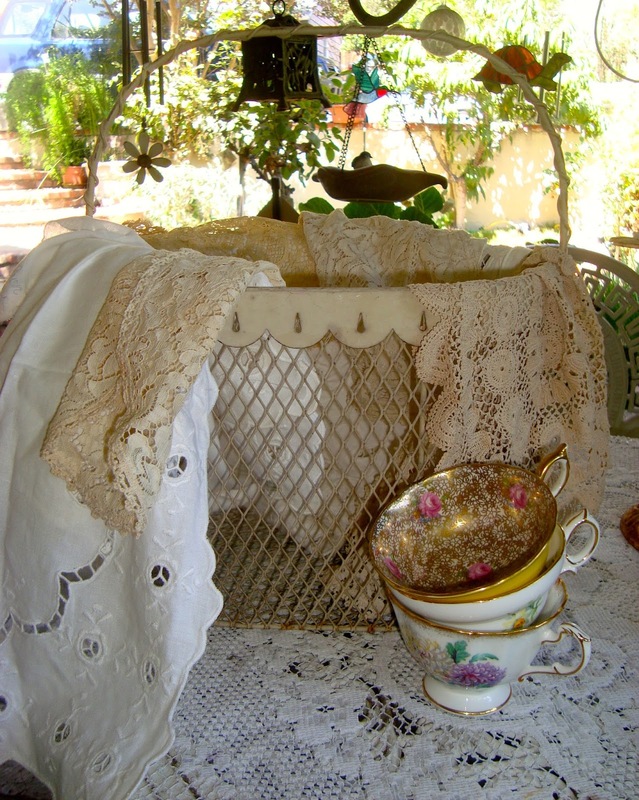 Love your French Iron Basket and this weeks beautiful teacups. That is great picture of your pretty daughter. Glad your son is doing better. Thank you for making my day today! 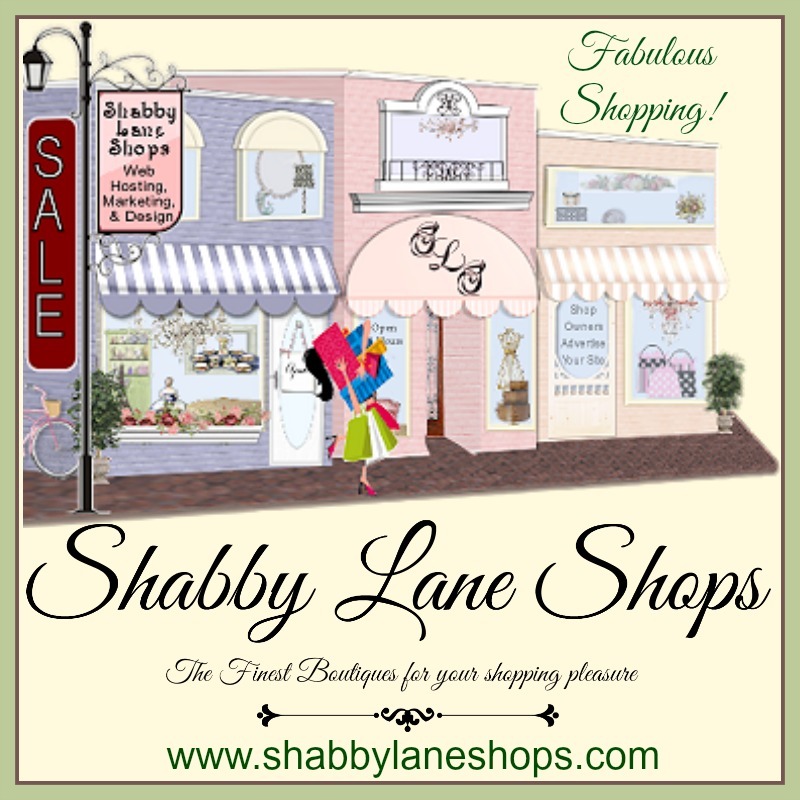 Your site is so lovely. Do you ever get to NoCal? I live in the bay area, any tearooms down south you can suggest? I just followed you. Thanks for doing the giveaway. Love your give-a-way cup ... each time I see it I think it should come live with me! Ha! Lovely post. You are getting ready for fall with your teacups in fall colors. Paragon makes beautiful cups. Happy to hear the news regarding your son and that school for the grands is going well. Thanks for hosting and Happy Tea Day! hanks for hosting Martha! That is a nice pic of your daughter. Hello! I finally have a tea cup or two to link up!! Your tea cups are stunning and I also want to say how much I love those roosters!! Thanks for the party, my friend!! Martha, I'm glad your son is feeling better! That is a lovely picture of your daughter and Happy Birthday to her! 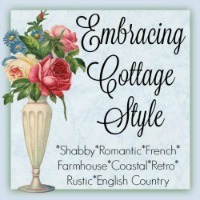 Pretty teacups and have fun decorating your home for the new season. I agree. Vintage lace does not count as too much stuff. It doesn't break nor take up much space. Love your big hen. I'm glad you're son is doing well, Martha. Happy birthday to your daughter. Your teacups are lovely and so is the lace! My favorite cup is the one with the mums...perfect for Fall. Thank you for hosting! 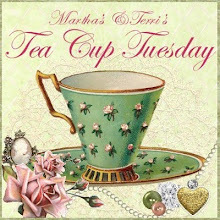 I'm late, I'm late for a very important date, Tea Cup Tuesday! What a lovely selection of golden tea cups. Martha, I love your beautiful cups! Sp pretty, and so is your beautiful,daughter! I pray that your son is restored to complete health. I adore the cup, but I am in the throes of scaling back some, and I am going to give my chance to another very lucky lady. It is so tempting because I adore china, but I am trying o be good! You are so sweet to do that. Hi Martha, Glad to hear the good news about your son. And Happy birthday to your granddaughter, she is lovely. 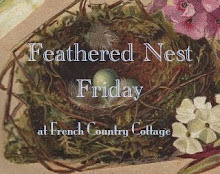 I love your cups and would love to go in your giveaway, but I fear it is too far to expect you to send something so fragile, so best wishes to all who have entered for your giveaway. Someone is going to be very lucky. Oooh, love that teacup you are giving away! I definitely think that lace doesn't really "count." 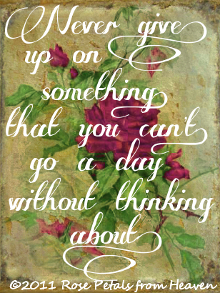 And I think the reason to de-clutter is to make room for the things that we really love. (I hope that doesn't make me an enabler! 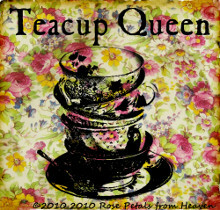 :) ) Your teacups are gorgeous, especially that first one. 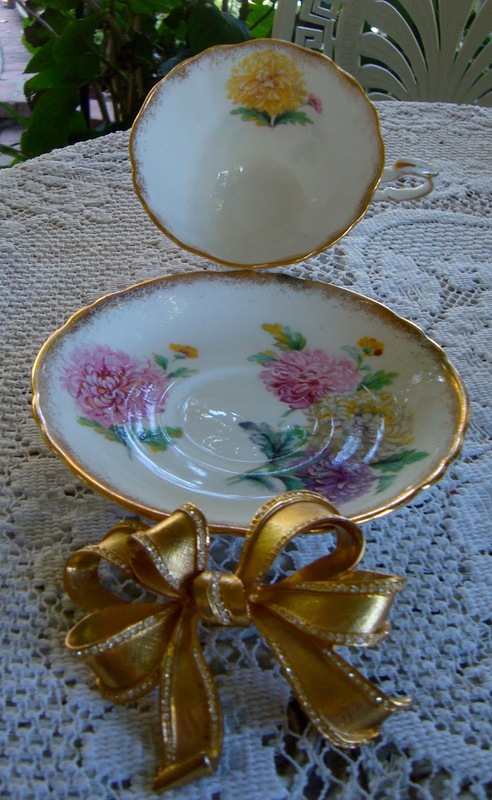 It's hard to say but that cup and saucer with the gold filigree pattern is my favorite! You have so many lovely patterns! I think you do an outstanding job decorating. I wish I had an eye for decorating like you do. Love the giveaway cup! Thanks so much for hosting this giveaway. The cups are all beautiful...the first one is my favorite. 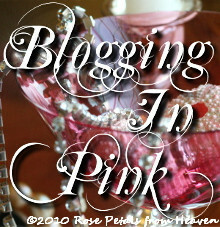 It has been a while since I was in blogland and certainly since I joined you in the Teacup Party. I do not seem to be able to upload both your badges? It is in a post of mine in 2012, so will see if that works, but maybe you could give me a tip?! DOING NORMAL THINGS WITH MY TEA CUP FRIENDS! TEA CUPS AND GOOD THOUGHTS! A LITTLE OUT OF CONTROL AND MORE TEA CUPS!